Sony's announcement that it had created the first consumer video camera with interchangeable lenses could well be the biggest thing to happen to the camcorder market this year. Innovations like this don't come around that often, especially ones which are designed to give the user more options for shooting rather than less autonomy. The idea of interchangeable lenses is one which has been in the consumer camera market since pretty much its inception, but it is something consumer video cameras have been crying out for. Changing the lens on your camcorder to suit your shooting environment means that you have complete control of what your footage will look like. 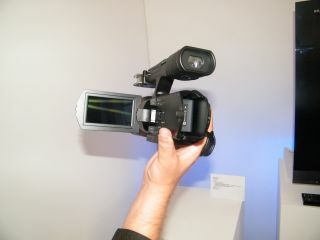 It also means that the Sony NEX-VG10E is not a camcorder for the point-and-shoot parade. It's not for the weak-armed either. The VG10 has a hulk of a chassis which has semi-pro written all over it (not literally as that would look silly). The hand-grip on the side does mean that it can be used for handheld shots, but we aren't expecting you to do this that often, not unless you want your arm to look like Popeye's. Despite its size, the shape of the camcorder is rather sleek. The on-board microphone (which offers sound from four separate omnidirectional microphone capsules) and the eye piece segue brilliantly together and the body seems more-than sturdy. There's also both a hot shoe mount and cold shoe mount on board, so you can add external gubbins like extra mics and lights. On-board is also a 3-inch LCD which has been given some high resolution imaging technology which means that you will be able to see what you are shooting even in bright sunlight. Unfortunately there are no touchscreen capabilities on the LCD, but the controls on the side are easy enough to manoeuvre. It's not the chassis, though, which is the most impressive thing about the NEX-VG10E – it's what is underneath in the form of the Exmor APS HD CMOS. As it is 19x the size of what is in most camcorders at the moment, it is a brilliant technological feat which means that you can shoot 1080p video and shoot 14.2MP stills as well. And as the camcorder deals in interchangeable lenses, there's a good bet that any stills photography you do will come out rather nice. When it comes to the lens situation, Sony is trying to create an ecosystem with its NEX camera range. You will be able to swap lenses between the NEX-3 and NEX-5 and if you have an additional adapter you can also add A-mount DSLR lenses to the camcorder. In short – if you have a Sony DSLR now, then you will be able to swap lenses freely between camera and camcorder. As this was a preview model we can't tell you about quality, but the potential of the NEX-VG10E is mouth-watering. Not only do you have a number of program modes, an aperture priority mode and the chance of surround sound audio, the interchangeable lens system means that you should be able to create cinematic shots from something that is billing itself as semi-pro. Although pricing hasn't been announced, Sony believes it will cost around £2,000. Yes it's expensive but it should make you movies look like they are worth a lot more. The Sony NEX-VG10E has a UK release date of October.